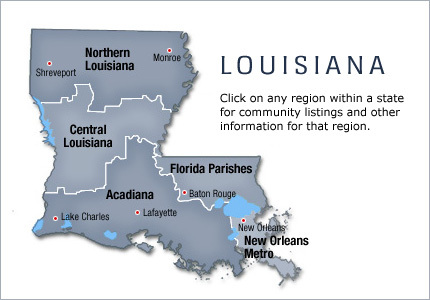 The State of Louisiana is a state located in the southern region of the United States of America. The capital of Louisiana is Baton Rouge and the most populous city is New Orleans based on March 2007 population data of 255,000 people. The largest parish by population is Jefferson Parish and largest by land area is Terrebonne Parish (Louisiana is the only state that has parishes instead of counties). The New Orleans metropolitan area is Louisiana's largest metro area.